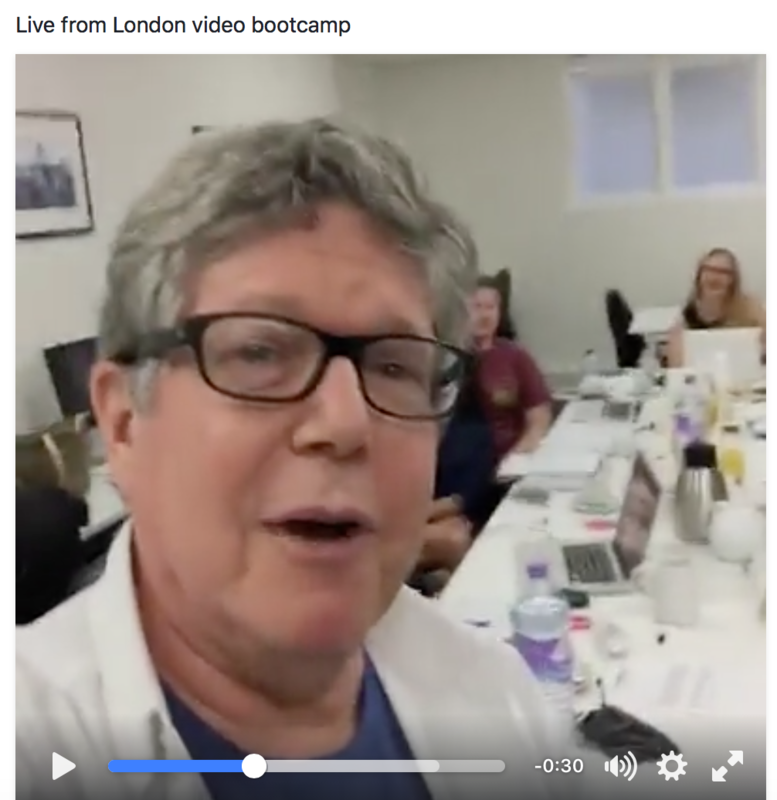 This week we are running one of our video bootcamps in London. 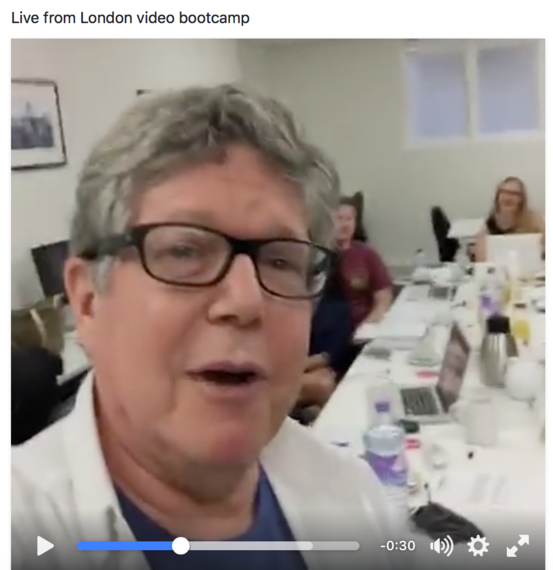 This morning, to demonstrate live streaming, something that simply did not exist a few years ago, we just 'went live' from our training room at the Thomson Foundation. Two weeks ago, I was at a meeting at IBM's Watson Project in NY. We started talking about live streaming, so instead of explaining it, I just did it. Not so long ago, going 'live' was incredibly complicated and expensive. It required sattelite uplinks or a microwave truck (if you were doing it locally). And it cost a fortune. Now, anyone can 'go live' any time they want, from anywhere, and it's no more difficult than literally pushing a button. Well, sure, cable news has much to fear. But I think every other cable channel has as much to fear, if not more. It's fine to 'go live' from some news story and have a reporter (or citizen journalist) go live. "I think we saw last week that Facebook Live could become the most intelligent cable news network ever built," said Jonathan Klein, a former president of CNN, who now runs a digital media company called Tapp. With more than 1.65 billion users, he said, "Facebook effectively has one and a half billion news bureaus to capture news, and they're capable of doing things that a cable news network could only dream of doing." Bleeding obvious (as we say in the UK). And who really watches cable news anymore anyway? The really interesting disruption is going to be all the other stuff - in other words, the lifeblood of cable.. and broadcasting. A few years ago, Lisa and I were at the Country Music Awards in Nashville (seriously), at the Bridgestone Arena. ABC was broadcasting the event live. There must have been 20,000 people in the audience. (I checked this on Google. Amazing what you can learn). Of those 20,000 people, maybe 10,000 were holding up their iPhones or smart phones during the concert, recording video and taking stills, no doubt. Now, those 10,000 people can also live stream the event. or pretty much any public event. But particularly live events that the networks (or cable) used to pay a lot for exclusive broadcast rights. What are you going to do? Confiscate all iPhones? Good luck with that. Arrest people who are live streaming? Good luck with that also. Technology trumps all (sorry to use that verb). And in this case, the live streaming genie is out of the bottle and there is no stuffing him or her back in again. All live, all the time, from everything is going to be the new rule of thump. But just like with Instagram for photos or Twitter for #140, whoever can aggregate and ordinate this coming tsunami of ive content is going to be the next big thing. As for broadcasting live events.... well, radio did survive TV. But not by much.